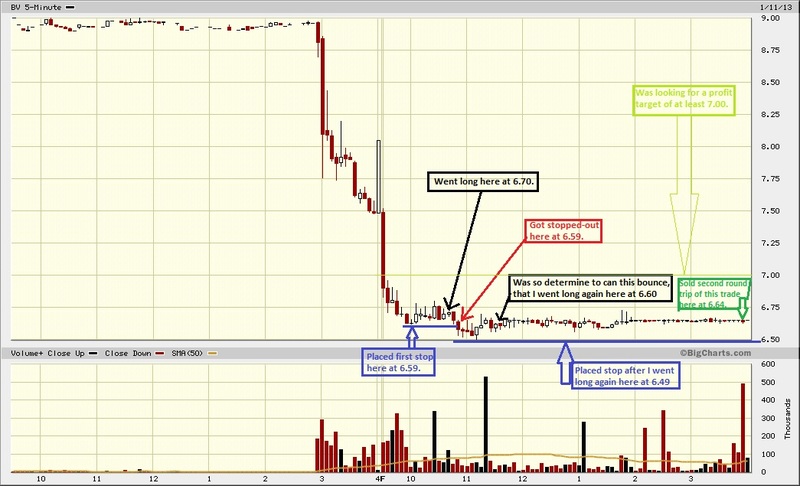 TRADER 9: Trade of the day, BV!!! Didn't do that much trading today. BV looked like a good contender when it sold off late yesterday, and was looking it might rebound some today. Went long 1000 at 6.70 on my first round trip trade and got stopped-out at 6.59. Then after it hit a nice support at 6.50, went long again 1000 shares at 6.60. I was hoping for an end of the day run-up that never did materialized and just sold it 5 minutes before the bell at 6.64 for a .04 point gain, but an overall .07 point loss when adding both round trips. Enjoy the weekend!